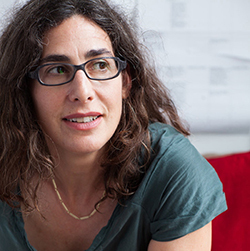 The 2015-16 season of the University Lectures concludes Tuesday, April 12, with Sarah Koenig, host and co-creator of the wildly popular podcast “Serial” and named one of Time Magazine’s “100 Most Influential People” of 2015. Koenig’s lecture is free and open to the public. The event begins at 7:30 p.m. in Hendricks Chapel. Doors open at 5:30 p.m., with entry through the main (Quad-facing) doors only. A sizable crowd is expected, so it is recommended that attendees arrive early. No tickets are required, and seating is on a first-come, first-served, basis. Overflow seating with closed-circuit coverage will be provided in the Joyce Hergenhan Auditorium in Newhouse 3; doors there open at 6 p.m. American Sign Language interpreters will be offered at Hendricks Chapel. Communication Access Real Time (CART) will be available at both locations. No audio or video recording is allowed. Koenig’s appearance is presented in cooperation with the S.I. Newhouse School of Public Communications, the LGBT Resource Center, the College of Visual and Performing Arts, the Criminal Law Society of the College of Law and the College of Engineering & Computer Science. After graduating from the University of Chicago in 1990, Koenig started out as a newspaper reporter, with her first reporting job at her weekly hometown paper, The East Hampton Star. She lived in Moscow for several years, working for ABC News and The New York Times. Upon her return to the United States, she landed at the Concord Monitor in New Hampshire, with stints as a crime reporter and then as a political reporter—the same beats she’d go on to cover at the Baltimore Sun. In 2004, she switched media and moved to radio, as a producer of the hit public radio series “This American Life.” She has guest hosted “TAL” several times and has produced some of its most popular shows, most notably “Habeas Schmabeas,” a 2006 Peabody Award-winning episode about Guantánamo Bay. “Serial” is credited with singlehandedly re-invigorating podcasting and introducing a broad audience to the possibilities of the format. The first season, launched in October 2014, set new records for podcast downloads and became the fastest podcast to reach five million downloads on iTunes (a figure it has now far exceeded). It followed the 20-year-old Baltimore murder case of teen Hae Min Lee and ex-boyfriend Adnan Syed, who is serving a life sentence for her murder. In April 2015, the 12-episode season was honored with a Peabody Award, becoming the first podcast recipient in the award’s 74-year history. The second season—launched in December 2015, with the final episode released on March 31—examines the case of U.S. Army Sgt. Bowe Bergdahl, who was taken prisoner by the Taliban and held for five years in Afghanistan before being released in a U.S. government-negotiated exchange for five Taliban leaders held at Guantánamo Bay. The lineup for the 2016-17 University Lectures season will be announced later this spring.